Utilizing Pay Per Click instantly provides a positive impact on your brand and allows it to reach more potential consumers. This level is exposure is acquired by getting your company in the top results on major search engines. We developed specific campaign strategies that meet the needs of each of our individual clients. 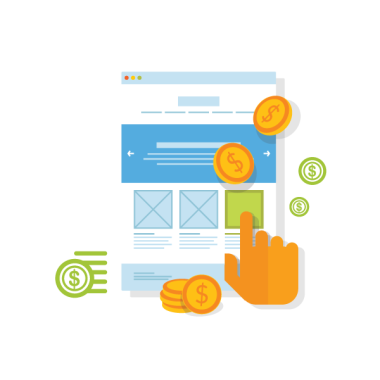 We will supply you with modern, Pay Per Click services that include: Display Ads, PPC Remarketing, Social Advertising, Video Advertising, and Paid Search Ads. We give our clients results and help them reach their business goals! We do all the leg-work and manage our clients' accounts daily, monitoring bid prices, ensuring that we are getting the most "bang for your buck"! We get these results because we methodically plan our customized approaches, which includes an in-depth overview of your business objectives and needs for PPC advertising. We finish this process by solidifying a prioritized list of activities we agree to carry out. Get the most ROI through our direct PPC search ads. Use your money wisely! Utilize this cost effective and direct method of advertising. Take your important 'potential customers' turn them into 'loyal customers' coming back for more. Allow our team to re-engage your users who have expressed interest in your product or service. We'll construct a logical strategy that will grab the customers you're looking for. Want to generate even more hype around your brand? Our specialists will develop content for social media platforms that are designed to meet KPIs and your goals. We design personalized display marketing ads that show your brand off to the masses, and lead to more engagements and conversions. And don't worry about a thing! We'll completely manage all your online campaigns while you take advantage of the interest it stirs up. GGG Marketing is committed to being the very best in online marketing and advertising. We're ready to tackle the challenge by providing you video adverts that will engage your audience and increase the impact of your brand on potential consumers. GGG Marketing has the power paid marketing experience to get you noticed on sites like Facebook, Twitter, YouTube, Bing, and Google AdWords.